I’ve been eager to eat at Milkwood since it opened last year. The team who opened it have a great pedigree, having opened some of Cardiff’s best eateries (Potted Pig, Porro, the Lansdowne). My eagerness was cemented by the Milkwood Team’s appearance at Bite festival in Insole Court this July. While I had reservations about the event as whole – too busy, no seating – the chance to try food from some of Cardiff’s most acclaimed restaurants was too much to pass. Milkwood served a lamb’s tongue with leeks and laverbread. I’ve never been one for tongue, but everything is better fried and crispy. It was easily one of the more interesting dishes available during the day. When a friend suggested dinner at Milkwood for a special occasion, I leapt at the suggestion. 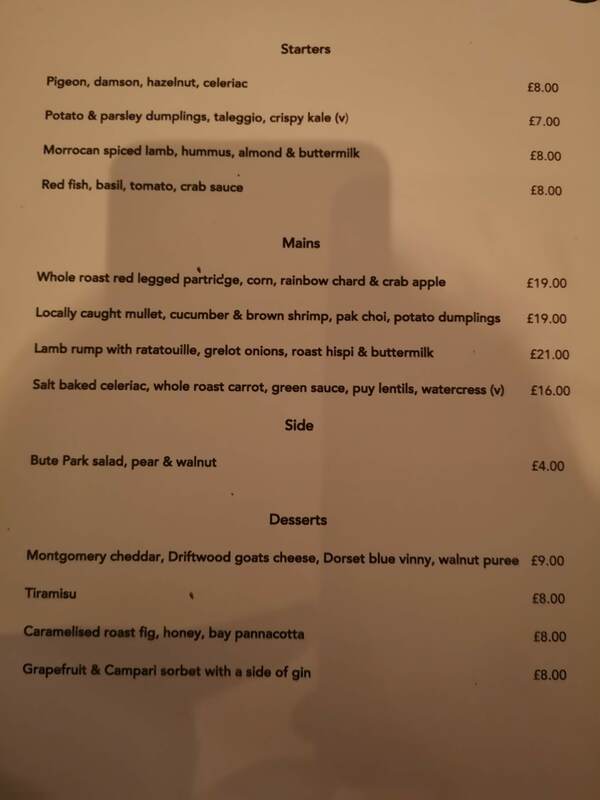 With starters around the £10 mark and mains about £20… the a la carte menu is fairly pricey by Cardiff’s standards. On a dark, drizzly night, the bright restaurant looked so inviting. The staff were warm and welcoming allowing lots of time for us to catch up and decide on what to order. The menu is short but succinct. It also changes regularly so I couldn’t research and choose in advance – my usual method to increase ordering efficiency on the night. Everything sounded delicious; deciding what to eat was to be challenge. N.B. I may or may not be allergic to nuts – it’s a long story which provided great amusement to my fellow diners as it may or may not be hypochondria. Allergy tests are on impending, but until then I am practising avoidance. Nonetheless, the test of a good restaurant staff is their knowledge of the menu. The wait staff told me exactly what contained nuts on the menu, double checked with the chef. I was also advised that they could make other dishes nut free if desired. However, if you have a very severe allergy I would recommend contacting the restaurant in advance. After seeing the glorious lamb served to a nearby table, I knew that had to be my main course, which eliminated the Middle Eastern lamb starter as an option. I instead opted for the potato dumpling with taleggio. Blame the Irish heritage, but I can never resist the lure of potato in any form. The lamb starter looked delicious, and was by all accounts. The empty plates of my fellow diners attest to that, over half ordered the lamb. 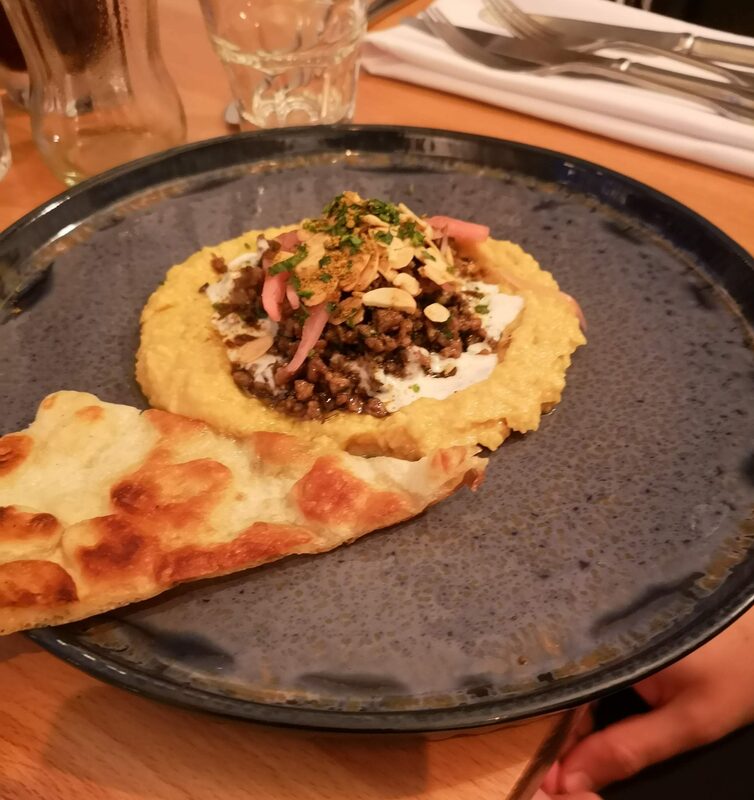 Morrocan spiced lamb, hummus, almond buttermilk on a really quite lovely plate. My potato dumplings were delicious: Soft and fluffy inside; crispy outside; and deeply savoury. The taleggio was a rich sauce. At this point, I realised I’d ordered fancy cheesy chips. The pickled shitake were a lovely counter to the rich cheese sauce and the crispy kale added height and some salty, greenery. It may have been fancy cheesy chips, but it was glorious. 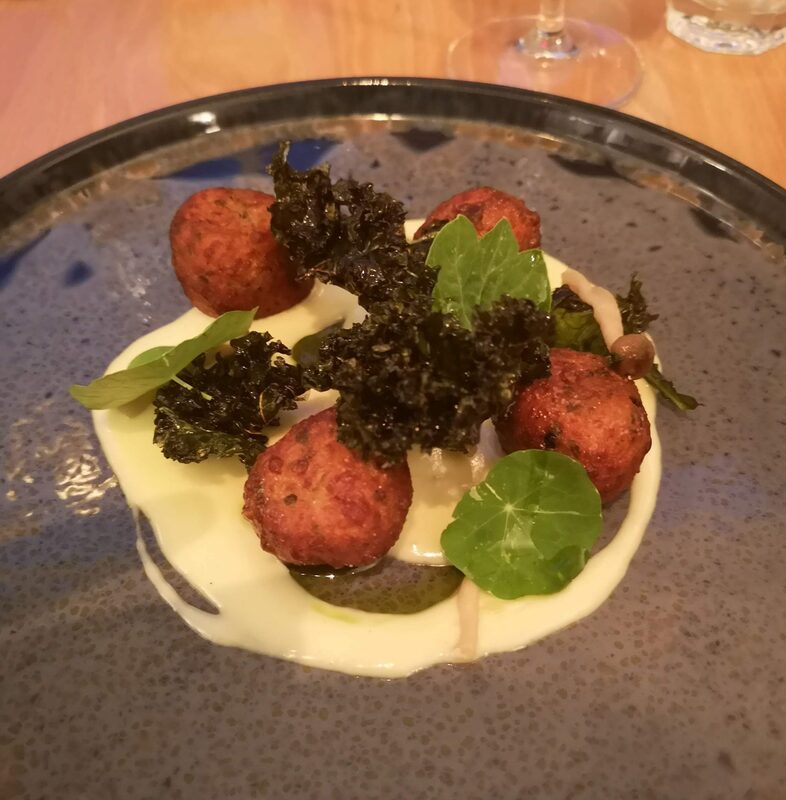 Potato and parsley dumplings, taleggio, crispy kale… plus the delicious pickled mushrooms that the menu omitted to mention). The same 3 who ordered the lamb starter, also ordered the mullet with a generous amount of brown shrimp. I hadn’t realised their main came with a portion of the potato dumplings as a side. My food envy was suddenly piqued. The remaining diner ordered the salt-baked celeriac main, which sounded delicious but no competition for the delicious lamb on its way. When it arrived, the lamb certainly looked the part – served perfectly pink. It came with two great big wedges of charred onions, on a bed of ratatouille with an artful puddle of buttermilk. I developed a taste for buttermilk on a childhood holiday to Ireland. Enticed by it’s promising name and seeing it in it’s big cartons, I assumed it was just a more extravagant dairy drink than your standard semi-skinned. I didn’t often drink buttermilk after that holiday but I did develop a taste for yoghurty, sour drinks. Back to the food, the charred onions were deliciously sweet and so perfectly cooked that they weren’t a slimy struggle to eat. The ratatouille was also tasty, the aubergine still had bite and it was well seasoned. The buttermilk was… buttermilk. 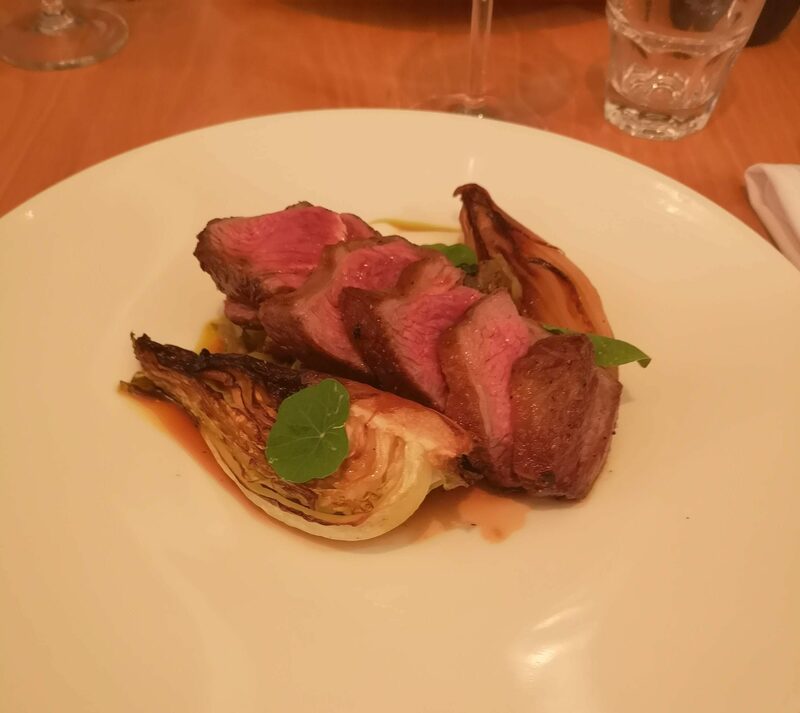 In hindsight, I can’t recall eating any of the roast hispi cabbage, nor can I see it in the photo – I can only assume it was forgotten. You might wonder why I haven’t mentioned the star of the show… that perfectly pink lamb rump. Truthfully, it was disappointing. The rump meat itself was tender, but not the tastiest lamb I’ve eaten – surprising as lamb usually has such a strong taste. It was also very fatty, fattier than you would expect even a rump to be. On almost every bite, I had to covertly remove gristly fat from my mouth. In Milkwood’s defence, I didn’t complain so I’m fully aware that one piece of meat can be vastly different to another. Equally, I didn’t give the staff a chance to respond. Either it didn’t help my food envy for that well cooked hake. Any disappointment was short-lived as we poured over Milkwood’s desert menu. I know a lot of people find a pannacotta a boring choice, but I love the comforting, milky quiver. 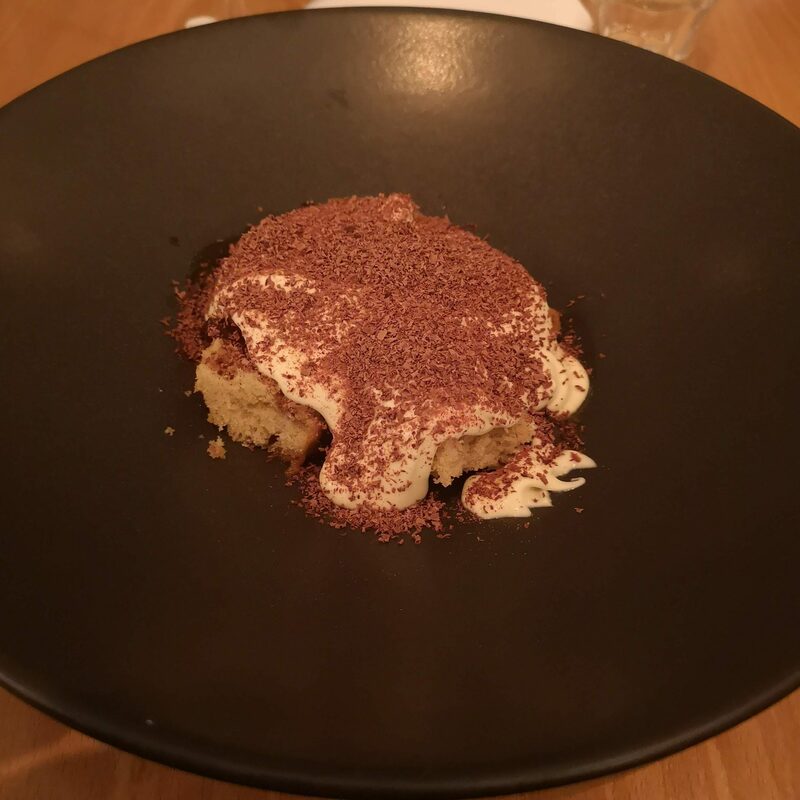 I also love the use of typically savoury herbs in a dessert, but remembering I had a figs for lunch, and 10 more figs in the fridge at home, I opted for the tiramisu over the bay pannacotta. Tiramisu. Not much to look at, but utterly delicious to eat. Thankfully, the tiramisu was delicious. The cream was sweet and unctuous. The sponge was soft but not soggy. There was a generous grating of bitter chocolate. The real standout was a jelly, hidden away under the cream and sponge. At first it caught me by surprise, as it wasn’t typically sweet. It had a sharp, winey flavour, possibly made from Sauternes. I didn’t ask the staff what the jelly was, but it was a lovely surprise that elevated the tiramisu to a new level. The greedy gannet that I am, I had some of the pannacotta too – delicious. To drink, I had a lovely French merlot that was reasonably priced. In conclusion, although I wasn’t enamoured with my main, other diners were delighted with theirs. The starters and desserts were delicious, so I can only assume my fatty, unpleasant lamb was an unfortunate anomaly. 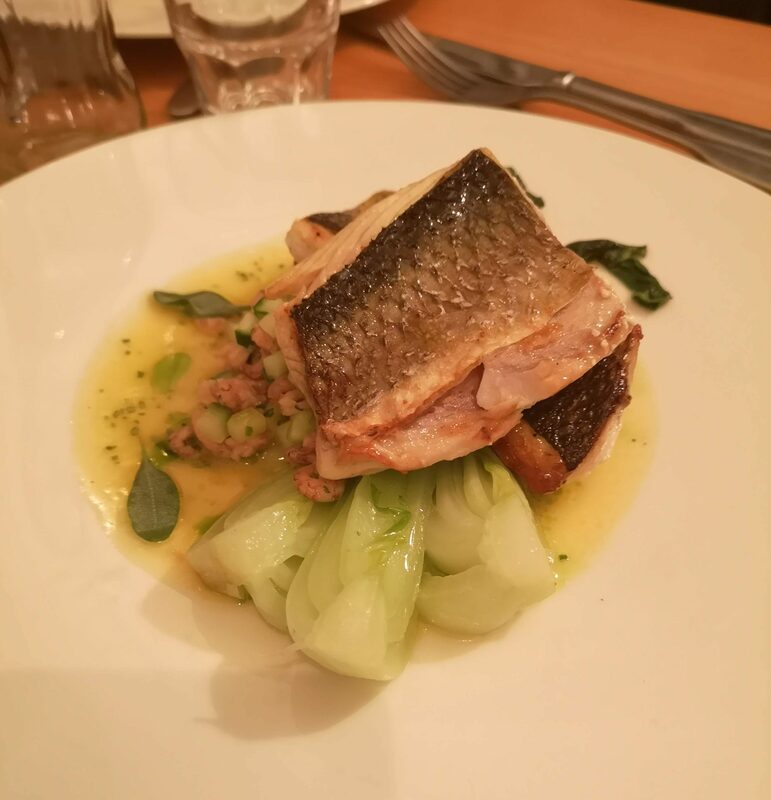 Both the staff and the food ensured that I spent a lovely evening at Milkwood and would both return to and recommend it. .
3 courses (including two glasses of wine and service) came to around £50 per head which wasn’t too bad. You can dine cheaper at lunchtime with the plats du jour which comes to £19 for 3 courses or £17 for 2 and a glass of wine. The menu and the awkward shadow of my phone.